To Torvanger on the "Ships starting with T" page. Picture is from Bjørn Milde's postcard collection. 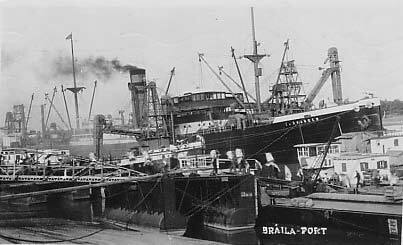 He says it was taken at Braila, probably 1939. Tonnage: 6568 gt, 4122 net, 10 750dwt. Machinery: Triple exp. 1800 ihp. Delivered in Oct.-1920 from Wm. Doxford & Sons Ltd., Sunderland as Grande Gaard to Henrik Østervold, Bergen. Taken over by Bergens Privatbank in June-1923. Purchased by Westfal-Larsen & Co. in Dec.-1939. A thread on my Ship Forum started by the daughter of Ordinary Seaman Reed (see crew list further down on this page). He also served on Galatea, Bur and Titanian. July 7 Liverpool   OB 180 Dispersed July 10. Sept. 29 Clyde   OB 221 For Panama. March 24 Liverpool   OB 302 For Halifax. Sept. 23 Loch Ewe   ON 19 For Baltimore. Page 2 gives arrival Hull Dec. 5, left Dec. 28. Jan. 5 Loch Ewe   ON 53 For Halifax. *Convoy BX 22, mentioned by A. Hague, did start out in Boston on June 2. Torvanger, however, left New York on May 31, and it's possible the intention was to join this convoy en route, but she could not find it and sailed on independently? See also the narrative below. Possibly with HX 194 & detached June 18, date approx. As will be seen when going to Page 1 of the archive documents, Torvanger was in Prince Rupert when war broke out in Norway on Apr. 9-1940, having arrived there from Yokohama. Her final destination was Vancouver, where she arrived Apr. 15. With lumber and zinc for Liverpool, she's listed in station 26 of the Halifax-U.K. Convoy HX 45 in May/June-1940, having joined with the Bermuda portion. She arrived Liverpool on June 7, and it looks like she subsequently remained there for a month. In July we find her, along with Solhavn and Varøy, in Convoy OB 180, departing Liverpool on July 7, dispersed July 10 - ref. link provided within the Voyage Record above (A. Hague has also included Barøy, but this must be an error as this ship was in the Homefleet). Torvanger's destination is not given, but from the archive document, we learn that she arrived New York on July 23, proceeding to Philadelphia that same day. On Aug. 12, she headed back to the U.K. in Convoy HX 65 from Halifax, which lost several ships (follow the link for details). She was bound for Glasgow with steel and scrap iron, arriving there on Aug. 30, and a month later, she's listed as bound for Panama from Glasgow in station 74 of Convoy OB 221, which originated in Liverpool on Sept. 29 and dispersed Oct. 3. Gallia and Solfonn are also listed (Askeladden was scheduled, but did not sail - again, see links in the table above). According to Page 1, Torvanger arrived Cristobal Oct. 21, proceeding to Brisbane a couple of days later. Her 1941 voyages also start on this document. With Brasil and Ferncourt, she joined Convoy BHX 110 on Febr. 17-1941, the Bermuda portion of Convoy HX 110, cargo of sugar for Belfast, station 92. HX 110, which originated at Halifax on Febr. 19, will be added to an individual page in my Convoys section, but for now, please see ships in all HX convoys - the Norwegian Cetus, Charles Racine, Drammensfjord, Leiv Eiriksson, Skiensfjord and Stigstad are listed. According to the Memorial for Seamen in Stavern, Norway (link at the bottom of this page), Torvanger lost a crew member on this voyage - Carpenter Adolf Leonhard Sande is said to have died in an accident at sea on Febr. 26-1941. She's later listed as bound for Halifax in ballast in Convoy OB 302, which left Liverpool on March 24 and dispersed 6 days later, Torvanger arriving Halifax on Apr. 7, having served as Commodore Vessel for the convoy (also available at the external link in the table above - Alaska, Polartank, Solstad, Stigstad and Vivi are also named). Having made a voyage to St. John, N.B. and back to Halifax (Page 1), she subsequently returned to the U.K. on Apr. 20 with Convoy HX 122, bound for Avonmouth with a cargo of grain, station 84, arriving her destination May 9. See also the cruising order/Commodore's notes. Together with Brant County, Madrono, Para, Stiklestad and Strinda, she later joined Convoy OB 327, originating in Liverpool May 28, dispersed June 1 (several ships were sunk - ref. external link further down on this page). Again, no destination is given for Torvanger, but from Page 2, we learn that she arrived Montreal on June 12 (having started out from Milford Haven May 27). She remained there for a long time; departure Montreal is given as Aug. 12 when she proceeded to Sydney, C.B., and Arnold Hague now has her, with a cargo of grain, in the Sydney portion of Convoy HX 145 on Aug. 17, for which Troubadour served as Vice Commodore; Kos IX and KOS VIII are named among the escorts (see Kos whalers). The following month, she joined the westbound North Atlantic Convoy ON 19, destination Baltimore, where she arrived Oct. 14, the convoy having been dispersed Oct. 7. On Nov. 10, we find her in the slow Sydney (C.B.)-U.K. Convoy SC 54, cargo of steel, cotton, tobacco and scrap for Hull, where she eventually arrived, via various other ports, on Dec. 5, remaining there for about 3 weeks. Eglantine and Montbretia were among the escorts for a while. With destination Halifax, she's later listed in Convoy ON 53*, which originated in Liverpool on Jan. 2-1942 and dispersed on the 19th, Torvanger arriving her destination on Jan. 24 (she had sailed from Loch Ewe on Jan. 5). Carrier (returned), Hallfried and Norse King are also listed. From Halifax, she continued to New York the next day, and as can be seen when going back to Page 2, she subsequently remained there for quite a long time; departure is given as March 5, when she returned to Halifax in order to join the slow Convoy SC 74 on March 12, bound for Cardiff with general cargo, station 82, arriving there (via Belfast Lough) on March 30, staying in Cardiff for 3 weeks. She returned across the Atlantic with Convoy ON 89*, which originated in Liverpool on Apr. 23 and arrived Halifax May 5 and also included Brønnøy, Cypria, Haakon Hauan, Hamlet, Nueva Granada, Pan Aruba and Samuel Bakke. Torvanger, however, was bound for New York, where she arrived May 8, according to Page 3; she had sailed from Milford Haven on Apr. 22, from Belfast Lough Apr. 24. What follows has been compiled with the help of a personal story written by Gunner P. Andersen, found in "Tilbakeblikk" - he had previously served as able seaman on the torpedoed Norness (follow the link for more of his story). 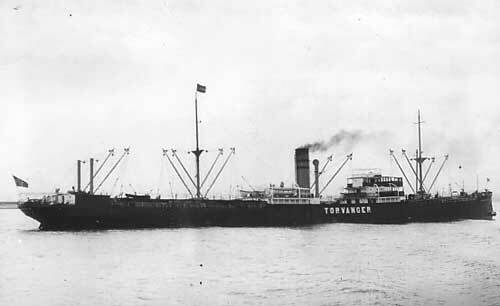 Torvanger was in Brooklyn in the spring of 1942 (as already mentioned above, she had arrived New York from the U.K. on May 8), loading 8000 tons of war materials, including tanks, ammunition, gliders in crates on deck and several thousand cases of beer for Alexandria, Egypt. She was to head out alone to Cape Town for bunkers, then on to Alexandria. According to Page 3 of the archive documents, she left New York on May 31. On her first day out, 2 Chinese men who said they had been on a torpedoed Norwegian ship were picked up from a lifeboat*. Since Torvanger was still fairly close to land, the captain decided to head for the nearest port with the 2 passsengers, but en route they met an American fishing boat which took the shipwrecked men on board, while Torvanger continued her voyage. A couple of days later, another 2 lifeboats holding 40 men from a torpedoed British ship were encountered. Captain Danielsen now chose to take this British crew to Halifax - from the archive document, we learn that she arrived on June 4. *Rainer Kolbicz (Uboat.net) has informed me that the 2 Chinese men were from the Dutch Polyphemus - see my page about Norland. In fact, Torvanger is said to have picked up a total 13 men from Norland and Polyphemus; 11 from the Dutch ship and 2 from the Norwegian ship. The British survivors she picked up were from Mattawin, which had been sunk by U-553 on June 2-1942, but there were 37 of them, not 40 - see this external page. While in Halifax, it was decided she was to take part in a convoy as far as the middle of the Atlantic, then leave the convoy and head for Cape Town alone, so they departed Halifax on June 14 in Convoy HX 194 and parted company as planned on the 19th ("Nortraships flåte" says 29th, A. Hague says 18th, approx.). She had been scheduled for Convoy HX 193, which had left Halifax on June 7, but cancelled. A very young messboy, who had never been to sea before, kept coming up to the gunnery platform asking all kinds of questions about the guns, ammunition etc. His dream was to become a gunner and he jotted down all the answers to his questions in a diary he carried around with him. On the 23rd he had his usual chat with Gunner Andersen, and had just left to fetch some lunch from the galley for those who were on watch when Torvanger was hit amidships, starboard side by a torpedo from U-84 (Uphoff - 39 40N 41 30W). The young boy was never seen again. The explosion was so powerful that Torvanger's new funnel went sky high and was blown to pieces. The middle of the ship was engulfed in flames, but the gunner could see the ship breaking in two, and managed to get himself beneath the gun platform to keep from being hit by the debris flying around. He says she was then hit by a second torpedo in No. 4 hatch and started to sink. He climbed back up the ladder to the gun platform which was then at water level, and attempted to swim away, but the suction of the sinking ship pulled him under, though he surfaced again and clung to whatever debris he could find floating around. After a while, he saw other survivors among the debris, and they managed to hang on to the crates that had held the gliders, then spotted the 2nd mate and the cook rowing towards them in a lifeboat. Some were pulled into the boat while others remained hanging on to the crates. 4 had died (3 in the engine room), 33 survived. There's no mess boy included in the casualty list, so I'm wondering whether Gunner Andersen is, in fact, referring to the 24 year old Canadian oiler Vernon Rasmussen (see link further down on this page) who according to a journal excerpt had just been sent from the mess room to fetch more food for the engine room crew when the torpedo struck and was believed to have been killed on the after deck. The U-boat came up and after the usual questions about cargo, destination etc. had been asked, the commander offered to take the injured on board for medical treatment. This offer was not accepted, but the canned bread, rum, cigarettes and salt water soap were. A 2nd lifeboat (another source says there were 3 boats) was found drifting among the debris. It had been damaged when the large crates had slid off the ship, but they dragged it up on a raft and repaired it the best they could, with the captain commanding one boat, the 2nd mate the other. The captain's boat was still leaking so they had to bail it constantly. According to the gunner the captain and 2nd mate couldn't quite agree on whether to row all night and sleep during the day, or vice versa, so on June 25 they parted company. The captain estimated they were about 600 n. miles from the Azores so they had quite a ways to go, but the weather was good, apart from an annoying wind against them at first. The crackers they had in the boat were full of worms, and they only had 25 liters of water which was rationed between them with a teaspoon per person every 8 hours. A large swarm of fish gave them hopes for dinner, and they tried to catch some with the help of a nail hammered into an oar, but had no luck with this contraption. They tried the canned bread they had gotten from the U-boat, but weren't overly impressed with the taste of it (to put it politely). A lot of whales were swimming around the boat, one of which was particularly curious and came straight towards them before disappearing beneath the boat. One of the survivors was so stunned that he hit it with an oar, to which the whale replied by "waving its tale", filling the boat with water. These animals proved unharmful to them, but the next visitors were a little more menacing, namely sharks - a giant one followed them for several days which made them rather uncomfortable. There was also a steam of swordfish jumping around them so they had to keep a certain distance to prevent them from landing in the boat. 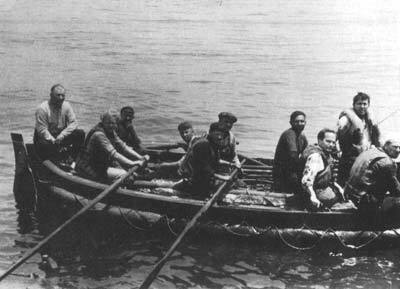 After a few days a strong wind blew up so Captain Danielsen tied a couple of oars together and rigged up a sail which made their progress considerably faster, but it only lasted for 2-3 days and they had to row again. On the 30th a French crew member spotted a ship far off in the distance and flares were sent up. It turned out to be the Dutch M/S Ruys, which had 45 (55?) women and 46 children on board (the gunner says she was coming from The East Indies with 400 passengers), so her captain was reluctant to go searching for the other boat(s), and headed directly for Liverpool (according to A. Hague, this ship arrived Liverpool on July 5, having sailed from Colon(?) on June 21; her voyage had started out in Sydney on May 29 - see this external page and go to "Ship Search", using "Ruys" as keyword). The other boat(s) made it to Fayal on Horta on July 5. Gunner Andersen subsequently joined Anna Knudsen. (He says he later met the 2nd mate from Torvanger in Gibraltar, who told him they had made it to the Azores, from there to Portugal and on to Gibraltar). Picture received from Rainer Kolbicz, who says it was taken by a war correspondent aboard U-84 while the survivors were questioned after the sinking, and comes from the book "U-Boote im Einsatz" (Herzog, Bodo -1970, Podzun Verlang, Dornheim). Time of attack is given as 11:47 on June 23. The first torpedo struck between the boiler room and deep tank on the starboard side, and a few seconds later another hit between No. 4 and No. 5 hatch aft. It was believed that the main steam pipe was broken in the explosion, because the engine room was full of steam and the engine stopped immediately. The starboard motor lifeboat was destroyed in the explosion. The door from the officers' mess room to the starboard passage way became blocked by crates (deck cargo) so the officers who were having their meal at the time had to get out on deck in a roundabout way. There was no time to send any distress messages because Torvanger sank in 2 minutes, listing to starboard. The 3rd mate, who was on duty on the bridge, the lookout, the helmsman and some crew who had been busy painting the lower bridge, started to launch the port lifeboat from the lower bridge, while the captain ran into his office to get some important papers which he lowered into the boat. The forward tackle had gotten caught and the captain cut it, but when doing so the boat drifted aft, as the ship still had some way. The radio operator and the 1st mate had joined him by then and jumped overboard (later picked up by the boat) while the captain ran aft and threw himself into the other port lifeboat which was still alongside, launched and manned by the crew from amidships. The rest of the crew aft, being unable to reach the boatdeck due to the deck cargo having loosened its lashings, placed themselves on a raft or jumped overboard and were later picked up by the lifeboats. As the ship went down the aircraft crates floated free, and they attempted to get the lifeboat clear of the debris, but when the foreship sank with the bow straight up shortly afterwards, one of the crates was thrown against the boat by the suction, breaking the wheel and knocking a 24" x 14" hole in the starboard side aft. Among the debris they spotted the capsized starboard gig, which had been located on the lower bridge, and with a raft in tow they rowed over to the gig, which was subsequently straightened, bailed and repaired. When the U-boat appeared and signalled for them to come alongside, the captain felt it was more important to get the gig and the lifeboat repaired, and get water and provisions transferred from the rafts, so the 1st mate's boat rowed over to the U-boat, which asked the usual questions about ship and cargo etc. The commander offered to take on board Galley Boy McNeil, who was burned, but he refused to go on board. Upon asking for their position, it was given as 4380 miles true west from Flores Island, Azores (quite a difference from what is stated in the gunner's story - I believe it's a printing error and should be 438 miles). Meanwhile, the captain's boat was repaired with the help of canvas and a 33" x 17" copper plate taken from an air tank they had found drifting nearby, probably from the motorboat, whereupon the survivors distributed themselves among the 3 boats, with the captain in the main lifeboat with 15 crew, the 1st mate in the second boat with the 3rd mate and 9 crew and 2nd mate Bunes in the gig with 5 crew. At 16:30 sail was set for the Azores, the 3 boats being kept together by a line. In the morning of the 25th, the captain suggested they divide those who were in the gig between the other 2 boats, but the 1st mate felt they already had enough in his 192 cub. ft. lifeboat. In addition to the 1st and 3rd mates, 3 able seamen, 2 ordinary seamen, the steward, the saloon boy, a galley boy and one of the donkeymen were in this boat. 2nd Mate Bunes assured the captain they had plenty of supplies in the gig, besides, they wanted to rest during the night, while those in the captain's boat wanted to row as much as possible in order to reach land as quickly as possible; the crew could row in shifts. So the captain decided to continue alone, and by the morning of the 26th the other 2 boats could no longer be seen. As mentioned, the survivors in the captain's boat were picked up by the Dutch M/S Ruys, Captain Verstelle on June 30, en route from Panama to the U.K. with general cargo and passengers. The position was 39 53N 34 43W, 92°, 120 miles off Corvo, the Azores. The 1st mate's boat and 2nd Mate Bunes' boat had stayed together, steering for Flores Island, expecting to see land on July 2, but when they did not, they continued. On July 4 they estimated being north of the island, but still nothing could be sighted, so they steered south for 60 miles, then east for 20 miles. Finally, in the morning of July 5 land was seen, then motor launches came out and towed the boats for about 15 miles into Fayal, Horta, where they were taken care of by the Norwegian Consul, Captain Liversage. They were dressed up, then sent to Fayal Hotel while awaiting transport to Lisbon, which took place on July 15 on board S/S Lima, with arrival Lisbon on July 24. (There was a Swedish motor vessel by this name, which was herself sunk a few months later - see this external page, but according to Uboat.net, the steamship that picked up survivors from Torvanger was Portuguese). The inquiry was held in Liverpool on July 13-1942 with the captain, the 1st engineer, 2nd(?) Mate Andersen Vang and the boatswain attending. For info, U-84 was sunk with all hands the following year - ref. external link at the end of this page. 2nd Mate Andersen Vang was in the mess room. Able Seaman/Gunner Andersen was by the gun. The boatswain was on the deck cargo on No. 6 hatch (jumped overboard). * There's also a Johannes Nenningsland among the crew of Trolla, which was torpedoed a couple of months later. The name is unusual enough that I believe it's the same person. ** There's a thread on my Ship Forum started by the daughter of Ordinary Seaman Reed; she says his name is David, and that he was in the captain's lifeboat (listed as George in the original crew list). Assistant Knutsen, Stoker Berglund and Oiler Jackson were on duty in the engine room - believed to have been killed instantly. Oiler Rasmussen had just left the mess room to fetch more food for the engine room crew when the torpedo struck and was believed to have been killed on the after deck. * Oiler Sidney Jackson is commemorated at Tower Hill, Panel 109 - more details can be found on this page on The Commonwealth War Graves Comm. website. The Canadian Oiler Vernon Rasmussen is commemorated at the Halifax Memorial, panel 22 - see this page as well as this page (both external). Stavern Memorial commemorations - Norwegians only. The text here gives the position as 33 90N 41 30W and says that in spite of a heavy list 2 lifeboats were launched from amidships, but loose deck cargo prevented the people aft from reaching that area. Some jumped overboard, while others placed themselves on rafts and waited till the ship sank, at which time the rafts floated free. They also found a 3rd lifeboat and set sail for the Azores. Stoker Erling Edvardt Berglund, Engineer Harald Andreas Knudsen and Carpenter Adolf Leonhard Sande are commemorated - the latter is listed as having died in an accident at sea on Febr. 26-1941. According to Page 1, Torvanger was on her way from Bermuda to Liverpool on that date (BHX 110). Back to Torvanger on the "Ships starting with T" page. Other ships by this name: Westfal-Larsen later had a tanker named Torvanger, delivered from J. L. Thompson & Son, Sunderland in March-1955. Became Liberian Efstathios in 1968. Broken up in Yugoslavia in 1973. Another tanker by this name was delivered in Jan.-1976, built in Poland, 17 057 gt. This ship later sailed as Bow Saint for Skibs-A/S Storli, Bergen from 1990, renamed Ncc Jizan that same year (majority of info from Westfal-Larsen fleet list). The text on this page was compiled with the help of: "Nortraships flåte", J. R. Hegland, Westfal-Larsen & Co. fleet list, "Sjøforklaringer fra 2. verdenskrig", Volume II (Norwegian Maritime Museum), and "Tilbakeblikk" (all listed in My sources).